Porto had a reputation for being a closed city with a lot of mystery. Even today, isolation defines it. Porto is not even near the vineyards whose dark and sumptuous “Red Portugal” wines, once inflamed by brandy, made it famous. Those vineyards, the great quintas, are a three-hour drive away and in a very different hot and dry climate. Certainly, the sun shines in Porto, but it rains as well. To this I can testify. Instead, Porto is a storied commercial centre. Here, English merchants began trading wool 500 years ago. They moved on to wine and the Porto economy was based on coopering, piping, maturing, bottling and shipping it. Nowadays, that economy has expanded to include every imaginable opportunity for drinking it too. The culture is unique Anglo- Lusitanian. In 1785 the English began to build the Feitoria Inglesa – the English Factory – a Palladian granite swagger of a thing, designed to entertain and to impress. You can arrange a private visit and meet the ghosts of generations of Symingtons, Warres and Sandemans. Their decorous dance cards and menus are on display. “Though forming but a small portion of society, they are tolerably conspicuous,” W H G Kingston, a mystery writer, said of these English in 1844. They existed in a state of adventurous prosperity, untouched by the cosmopolitanism of a capital city. Accents and manners and tastes which evolved at home, remained stationary in Porto. Modern Porto is still a very old city. 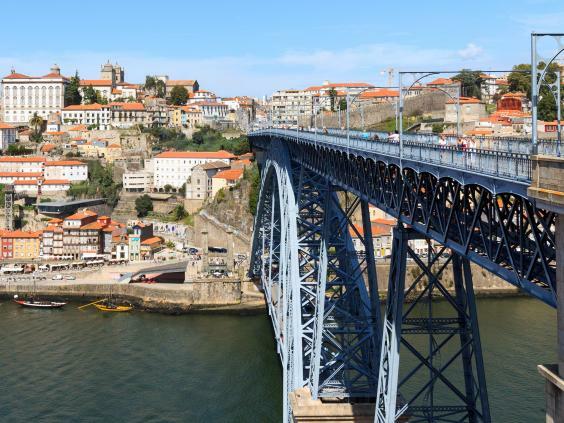 It is architecturally spectacular, with six vertiginous bridges (two of them from 1877 and 1887 by Gustave Eiffel and his partner, Theophile Seyrig) spanning the elegantly winding Douro. The grey iron tracery of the Luis I Bridge locates Porto in the Gothic north, but the dominant red pantiled roofs draping the river’s steep banks speak of the south. Prosperous Porto began to decline in the Sixties: those who could afford to left the town centre and moved out to Foz or Matosinhos on the Atlantic coast. Stupid rent control laws deterred property maintenance and in 2005 Porto Vivo, a revival initiative, found that only four per cent of the centre’s old properties were in an acceptable state and fully half in serious disrepair. But in less than 10 years, nearly 70 per cent of the centre’s properties had been improved. The densely built historic centre (now protected by Unesco) tumbles down to the water, on occasions precipitously. The revival is real, but old Porto still seems dark, strange and almost African. It’s a place I have always wanted to visit. On final descent you pass over large areas of more modern factories, a reminder that, after a long malaise, the local economy is getting better. Pharmaceuticals, clothes, furniture, and building materials are produced here. The last is specially significant. A population of a mere 10 million has produced an outstanding number of world-class architects, including Siza Vieira, Eduardo Souto de Moura and Adalberto Dias. The Portuguese are rightly proud of this. Thus, Porto’s new airport is a cheerful place with lots of brightness, skylights and metal tension rods designed by ICQ, a large local practice: it advertises a new sense of collective urban identity. Downtown, on the Rua do Almada, a shop called cbc sells knobs and knockers by winners of the Pritzker Prize, including Souto de Moura and Siza themselves. This in a once impoverished city whose retail offer was characterised by strange hybrid shops selling steam irons and canaries. The geography of Porto is simple, but decisive. It is where the Douro meets the Atlantic: the name refers to the Latin for “port”. The historic centre is north of the river and Vila Nova de Gaia is on the south. Vila Nova is where the grand old port lodges have their premises and the skyline is emphatically punctuated by signs which read like the last pages of a wine list: Offley, Graham’s, Fonseca and Taylor’s. It is low-rise, but from the other side of the Douro, it dominates Gaia. The historic centre of Porto is compact and easily manageable on foot in a day. Sao Francisco has an interior of bewildering, dripping gold, simultaneously sick-making and breath-taking, deeply satisfying, but bewildering too. What psychological state is revealed here? Whatever could the brief have been? Sao Bento is the railway station with its fabulous azulejos tiles. Lello is the Gothic-Art Nouveau bookshop whose dark wood and crazy staircase are said to have inspired J K Rowling when she taught English here. It is opposite the Universidade where students swarm in Hogwarts gowns, so this might even be true. Porto is big enough to be interesting and small enough to be intimate. I have only one test of any city or hotel or restaurant : “Will I go back?” Yes I will.